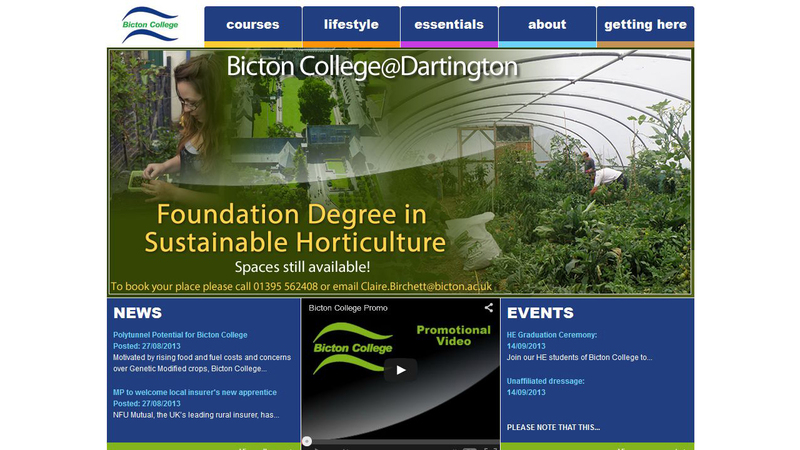 Cosmic produced a new design and developed a website for Bicton College. The volume of content had to be carefully managed to ensure a user was not overwhelmed by content. We made the parent navigation level as simple as possible so that subsequent pages can be neatly categorised. Thereby hiding a large amount of content behind a simple top level. The courses section utilises a tagging system that enables sorting by course type and also course level. The course filter is simplified by using image heavy buttons. The client can edit the content themselves, publishing new pages, news, courses and events without the need for a developer. Bicton College is a leading land-based college residing in the heart of Devon within an area of outstanding natural beauty.